The Dignity in Schools Campaign Model Code on Education and Dignity presents a set of recommended policies to schools, districts and legislators to help end school pushout and protect the human rights to education, dignity, participation and freedom from discrimination. The Code is the culmination of several years of research and dialogue with students, parents, educators, advocates and researchers who came together to envision a school system that supports all children and young people in reaching their full potential. Five chapters organize the 104 page document. They cover Education, Participation, Dignity, Freedom from Discrimination, and Monitoring and Accountability. 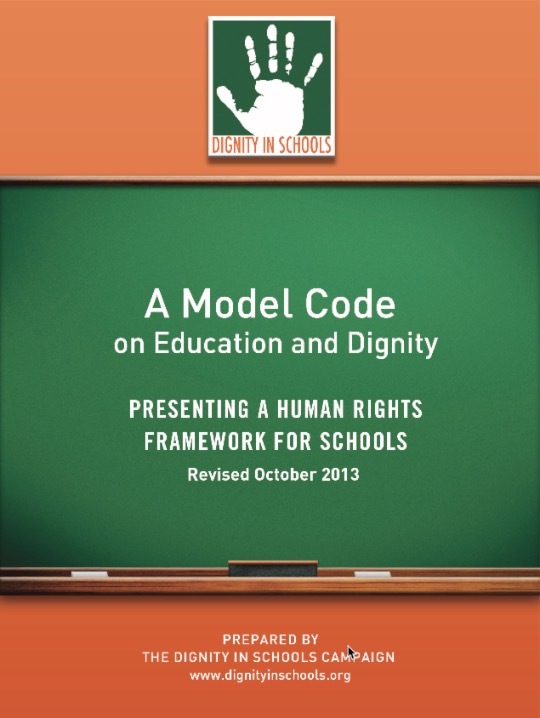 In October 2013, DSC released a new revised version of the Model Code, which includes new sections on: social and emotional learning, prevention and response to bullying behavior, reducing tickets and summonses issued in school, reducing racial disparities in discipline through culturally responsive classroom management, creating safe schools for LGBTQ students and other topics. A community toolkit was also created to help groups make good use of the Model Code. It is available separately.